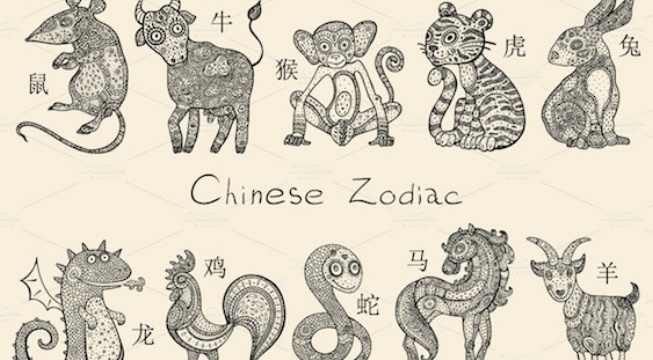 The Chinese Zodiac is a cycle of 12 years, where each year is represented by one of twelve animals. There exists a story, in Chinese mythology, of a great race that decided which animals made it into the Zodiac and in what order. Two main variations of the myth exist. In one variation the Jade Emperor, the ruler of all gods within Chinese mythology, hosted the race. To finish the race and become one of 12 animals in the calendar, the animals had to cross a river. Here's our interpretation of this story! The great race loomed just on the horizon and the Cat and the Rat were best of friends. Together, the two of them hatched a plan to ride the Ox across the river together. They knew the large and hardy Ox was accustomed to crossing rivers and would likely finish first. At the start of the race, the two animals slipped atop the Ox. Being rather thick-headed, the Ox was oblivious to the two animals atop him. But, as the Cat and the Rat rode atop the Ox, the Rat jolted abruptly forward. The sudden force sent the Cat flying off the Ox and into the river. The Cat let out a piercing hiss directed at the Rat, but by then, it was too late, and the Ox, with the Rat atop, was already too far ahead of the Cat. Even to this this day, Cat still holds a grudge against Rat. This is why Cat hates water and hunts Rat every time he sees him! The Ox lumbered towards the finish line. The Ox was going to come first. Suddenly, the Rat leapt from Ox's back and crossed the finish-line first. The Ox crossed the finish line a moment later. However, the Ox was too composed a sort to make a big fuss. Water splashed forth from the river. The Tiger had burst from beneath the water, his coat sopping wet. The water had weighed the proud Tiger down, but the well-muscled Tiger pushed forth in spite of the burden, hind legs rippling with tense firmness. His huge paw prints bore down on the damp muddy shore and with one final fierce stride, the Tiger claimed the third spot in the Zodiac. The Jade Emperor watched as the trio of Rat, Ox, and Tiger crossed the finish. He applauded them. They would be the first three animals of the Zodiac. The Rabbit stood perched upon a rock in the river. He was only lagging slightly behind the Tiger. River water lapped up at his paws. The Rabbit let out soft huffs and heaves. He had been trying desperately to keep up with the Tiger. Despite the Rabbit's small stature, he had kept pace, leaping from one rock to another so he could quickly cross the river. A long trail of rocks jutted up from the river bed. As worry overtook the Rabbit, the Rabbit hastened his motions, pulling back hurriedly on his strong hind legs. The Rabbit feared that if he did not pick up his pace, another animal might seize the fourth spot from him. Suddenly, the Rabbit slipped, tumbling back-first into the murky waters of the river. The Rabbit's thoughts began to race. Would he even be able to finish in time? A moment later the Rabbit's eyes widened. A log was floating slowly by. Nearly leaping up from the river, the Rabbit sped into a wild paddle, water flying up around him. He pressed both paws to the log, clinging on as tightly as he could muster. The Rabbit did not stop as he passed the Jade Emperor. The Emperor was smiling at the Rabbit with a generous grin. The Rabbit passed rice paddies as he made his way towards the forest. Reaching a shaded and secluded thicket the Rabbit collapsed into a tiny heap of white fur. A mix of relief and exhilaration had seeped through his being, replacing the disappointment he had felt about only getting fourth place. Over the finish line the Dragon soared swiftly, moving in a majestic aerial stride as it shimmied through the clouds, his long tail streaming and lashing about the placid sky, wind racing past him. As the Dragon made his rapid descent, the clouds seemed to part. The Jade Emperor stood awaiting the great creature. Why has the Dragon not come in first place? he wondered. When the Jade Emperor addressed the Dragon, he began to explain the circumstances that had befallen him. "Exalted Jade Emperor ~ on my way I saw several villagers that were in trouble. A fire had ignited amidst their crops and they had been surrounded in a circle of blaze. I knew that my spot in the Zodiac was on the line, but I could not stand by and watch. To put out the flames, I used my breath to extinguish the blaze, snuffing it out like a flickering candle. I had to be careful though. I did not want to also sweep the villagers up in this gale of my own creation. I also saw a tiny Rabbit in the river clinging to a log, so I used my breath to push it to shore." The Jade Emperor smiled again. He was well acquainted with the Dragon's nature. He was not disappointed in him. As the Dragon and the Jade Emperor spoke, the Horse was in the midst of galloping across the river, splashing up water as her hooves moved like beating pistons through the ankle deep water, beads of mist silhouetting her strong equestrian form. The Horse burst from the river. Only a few strides separated her from the finish line. Something slithered through the grass. From the grass the Snake surged out, approaching from behind the Horse's hooves. Overtaken by shock the Horse recoiled, leaping backwards. A high nay exited the Horse's mouth, hooves thrown up towards the sky. With a quick slither, the Snake crossed the finish line. The Jade Emperor watched the snake move past the finish-line, still smiling. He did not judge the Snake. The Snake had merely been clever. The Horse lowered her long-face, a tinge of shame lingering in her dark beady eyes as she stepped slowly across the finish line. Fear had cost her the sixth spot. Her legs, which moments ago had carried her in an untamed gallop were now locked in slow shaky steps, which barely left imprints upon the dirt. Back in the river, the Monkey, the Rooster, and the star of 2015, the Sheep, all floated atop a raft, which the Rooster had found resting by the opposite shore - unclaimed by anyone. Together, the three of them worked furiously, using lengthy branches as makeshift paddles.The sticks would often get caught in tangles of unwieldy underwater weeds, which weaved up from the riverbed, but the three of them did not stop paddling, severing the leafy binds with forceful branch strokes. When the Rooster, the Monkey, and the Sheep reached the river's shore, they let the Sheep cross first - claiming 8th place. The Sheep had been so comforting and formed such harmonious bonds with them, that the others felt it was only right to let the Sheep claim the 8th place. If the sheep had helped foster these bonds, they may not have all made it to the finish-line. The Monkey claimed the ninth place and the Rooster took the tenth place. Coat sopping wet, the dog scrambled across the finish line next, panting as he did so, canine tongue flapping from his open mouth. The dog was an adept swimmer, but because he had not bathed for some time, he had over indulged in the river, frolicking without a care in the water. The sun sat high in the sky today and had heated the water, making it pleasant to bathe in. And, thus, the dog claimed the eleventh place in the race. By the finish line stood the Jade Emperor. Eleven animals had already crossed. There was only one spot remaining in the Zodiac now. What animal will conclude the race? the Jade Emperor wondered. The Jade Emperor gave the pig a sharp glance as he crossed the finish line. "How has one such as you who possesses such surprising speed fallen so far behind?" he asked. The Pig snorted as he readied himself to speak. "Sorry, Exalted Jade Emperor - I was hungry and couldn't resist stopping to gobble something up. I felt sleepy after eating, and couldn't help myself." The Jade Emperor smiled again as he peered down at the dirt covered Pig. The race had concluded. The Pig collapsed onto his side, lapsing back into sleep. Snorts that sounded like snores sounded from the Pig's rotund heaving form. The 12 animals of the Zodiac had been decided and so concluded the great race.